The latest from Chilbolton. It might look like the moon, but it's just the exposed chalk which is usually just a few cm below the surface. 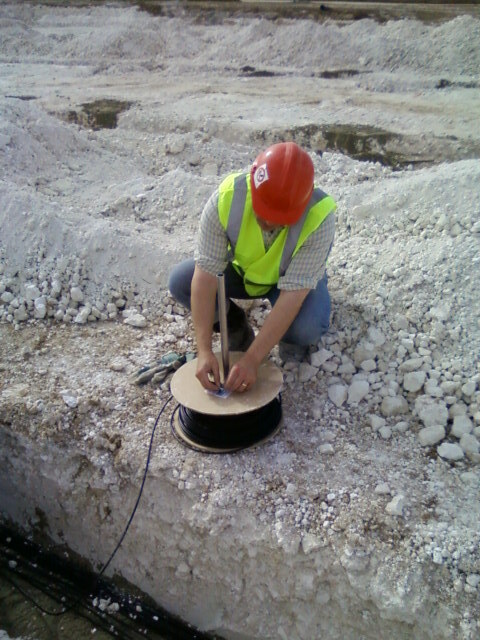 In order to deploy the cable quickly and with the minimum of spoil falling back into the trench, the cables are run from a specially built cable reel. Each cable is fitted to the reel, and it is then run out. This efficient method makes the 36 km (22.5 miles) of cable installation more bearable. In this first picture, Harry Smith fits a new cable to the reel. You can just see some of the cables that are already in the trench at the lower left of the image. Here, Fraser Clarke runs out a cable while Jon Eastment holds the end secure in the trench.